From The Compound: Change the words, change the life. Change the words, change the life. 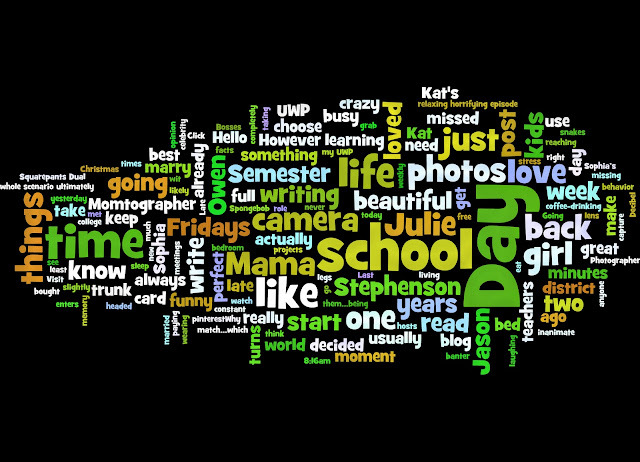 According to Wordle, here are the words written most here at From The Compound. I made this as a guide for me see if I was headed in the right direction with this blog, which is typically a pretty good representation of my life. Some of what I saw, I expected. Words like love, camera, school, write & life. I knew I would see those. Then there were words I was not expecting to see as much, like need, busy, crazy, choose & stress. This really is a pretty good indicator of what 2011 was like for me. I was doing many things that I loved, but because I didn't have enough structure, balance and control, I wasn't loving what I was doing. I spent too much of my time worrying about pleasing others. I tried hard to be a little bit of everything to everybody, and kind of forgot who I wanted to be. As 2011 ticked away, I knew I would require a change if I was going to achieve all I have planned. I have lofty goals. I dream big, and I have a lot to get done in this lifetime. This time next year I plan to see these words in this exercise - awareness, thanks, peace, intention, laugh, calm, happiness, mindful, discipline, gratitude, fulfill, give, reflection, fun, & spirit. I know 2012 will be my best year yet.